Don’t let the green leaves in the background trick you. I finished knitting and blocking this hat just in time to wear it for the weekend’s snow. When I moved to Los Angeles, I only brought one hat knitted hat with me, the Slouchy Babe. That was fine for awhile because it never got cold enough to wear it. Then I moved to San Francisco, the land of fog and rain, and actually needed a hat. Slouchy did it’s job admirably, but I got bored of only wearing one hat. But not bored enough to actually cast on for another hat until I moved again. Road trip knitting is a definite necessity after all. 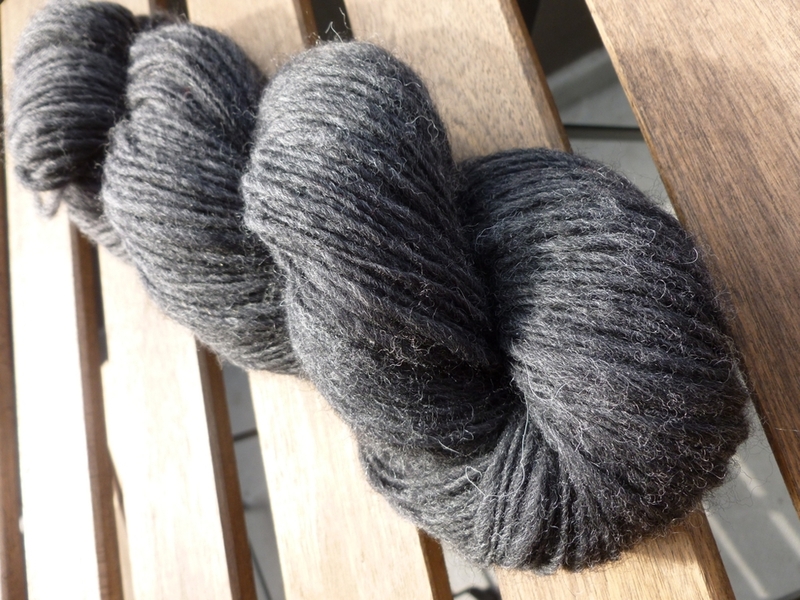 Alex Tinsley’s Fructose had been near the top of the queue for awhile and I already had the yarn picked out, a sparkly handspun single. I cast on the week before the cross-country drive and stashed it in my purse for the trip. Fructose turned out to be the perfect project. It was simple enough to let me knit while checking out the scenery and easy to come back to after navigating or putting it down for the night. I knit while we drove across stormy Donner Pass. I knit round after round across deserts, salt flats, plains, and mountains. Sometimes I took it out just put in my lap and stare out the window. I put a few more rounds on it after The Bearded One and I were unpacked. Then I couldn’t knit for 2 frustrating weeks which is why it took a month for me to finish. The hat’s worth the wait though. It’s warm, cosy, and cute too. 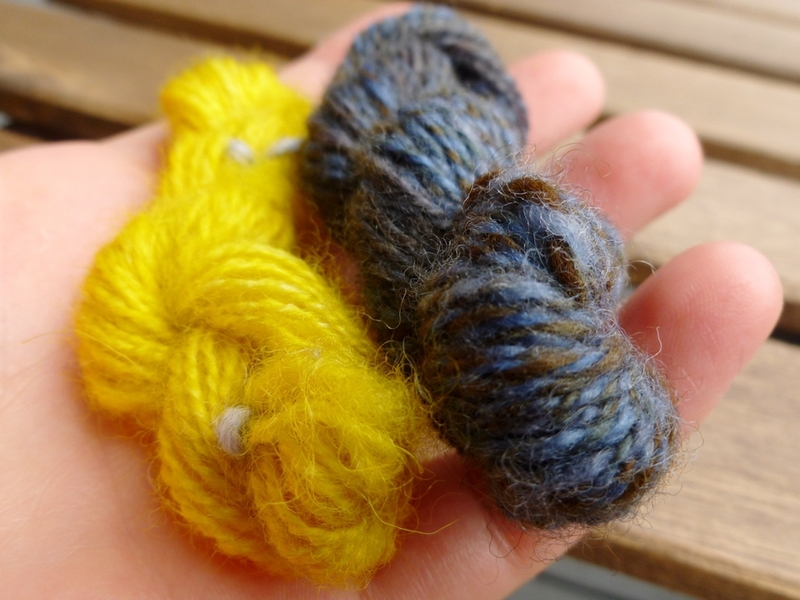 I spun the yarn, a blend of Columbia and green Firestar, during the 2015 Tour de Fleece. I only had 2 oz of fiber so I decided to keep it as a single. It’s definitely not my most consistent handspun but the thick and thin created great texture within the ribbing. 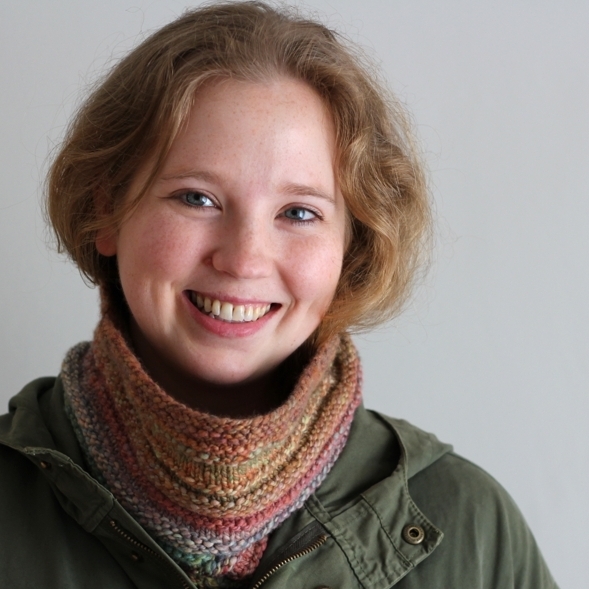 Going to file that trick away for the next time I knit with wild or wild-ish handspun. I haven’t given up on the #handspunchallenge and this hat is only making me want to knit with more of stashed beauties. When I cast on I was a little worried that the sparkle from the Firestar would be overwhelming. It’s not though. The Firestar adds mottled color and only up close does the glint of the fiber come into play. Glad I didn’t shy away from it and skip the sparkle. My first handspun of 2016 is officially finished! I’m thrilled with how it turned out, but I have to admit something. Sometimes I buy fiber because I like the look of it and want to try working with something new without much thought to what the finished yarn will look like. That’s definitely what happened when I bought the roving that became this single. Doesn’t always work out, but it did this time. I loved the smooth single I saw on the bobbins and didn’t want to fuzz it up during finishing. So, the yarn got a good 20 minute soak in cool water. I snapped the yarn over my arms to even out the twist, but skipped giving the yarn a good thwack it again the shower wall - didn’t want the halo that can come from thwacking. Then I hung it up to dry. The single did plump up a little after it’s bath, but it still has a smooth surface which helped the seacell keep its luster. Time for my second admission. If I saw this yarn at a shop I’d think it was pretty, but I wouldn’t buy it. Why? Simple. I’d have no idea how to make the most of it. Not going to let that stop me this time though. I’m sketching and swatching up a storm. The good thing about making all my sketches on post-it notes is that I can put them all up on the wall and see what sticks. I might not use the single for the eventual design, but I’m glad to have the challenge. Sometimes you just need a creative shot in the arm. To be reminded of just of much more is out there to make and play with. To try something new instead of just sticking with the familiar. On the spinning front, that’s what the Sarah Anderson’s Spinner’s Book of Yarn Designs has done for me. Looking through it’s pages, I saw so many new things that I wanted to try. That book is treasure trove of inspiration and technique. 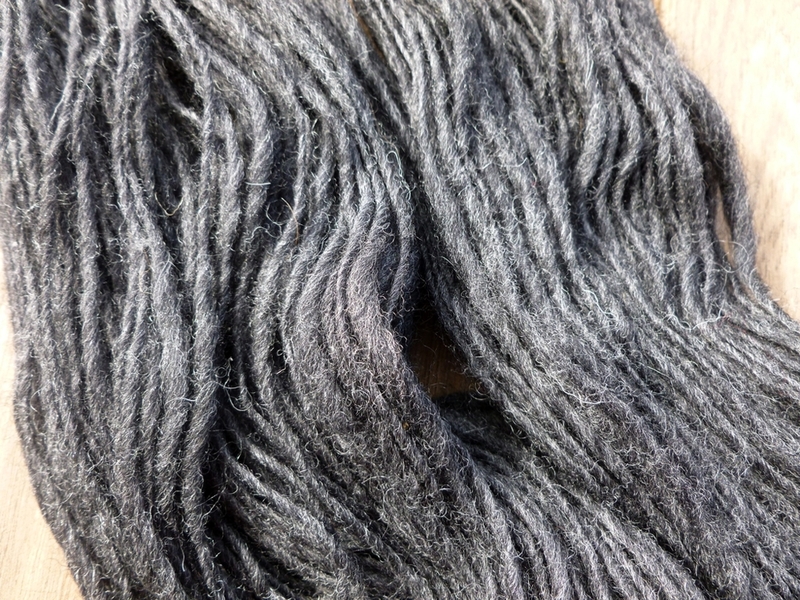 One of the first yarns shown is a slub yarn where the single is thin with intentional thick bumps, aka ‘slubs’, throughout. 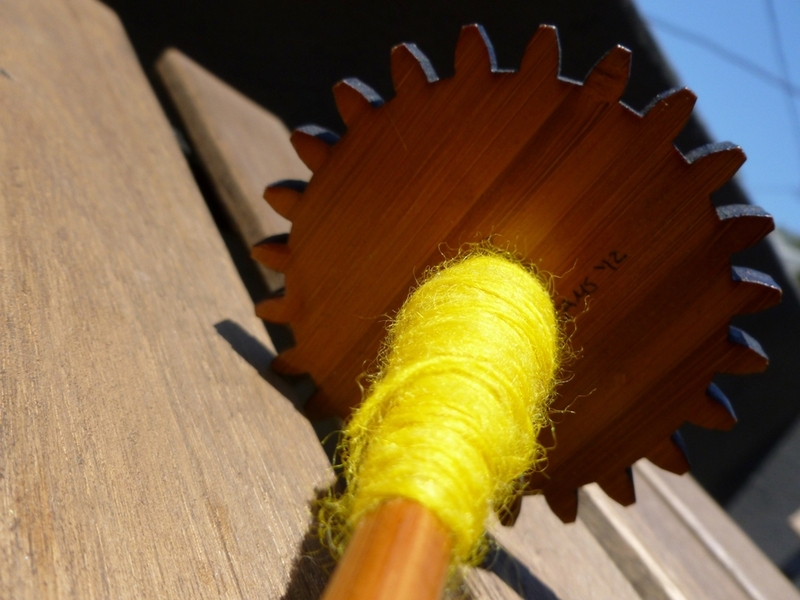 The tutorial teaches how to spin a slub yarn but also acts as a stepping point to spinning fat and chunky singles. Anderson’s fat singles look so squishy, colorful, and consistent. Who wouldn’t want to be able to spin and knit with such a great yarn? I haven’t spun anything close to a fat single or a slub yarn since I first started spinning and that seemed to be all I could make. My default yarn has thinned over the time and I wanted to see if I could bump it up a little with help from my spinning wheel. So, I set up the whorl with the slowest ratio and got started. Side note: treadling slowly takes more concentration than you’d think. I set out of spin a slub yarn, honest, and the first few yards definitely are. 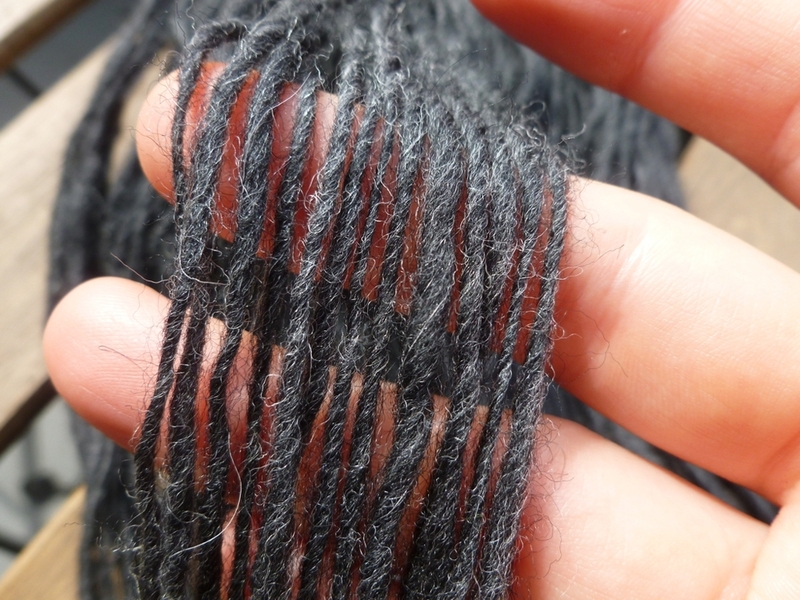 However, as I got further in, it was easier to spin a consistently thick yarn than to switch between thick and thin. Since my end goal was a fat single anyway, I just went with the flow. Washed and finished, the yarn is hardly uniform. There are stretches of thick yarn and stretches of thin yarn. There are spots where the twist is just barely holding everything together. There’s also 1 knot, but who’s counting? Oh right, I am. Inconsistencies aside, the skein is soft and undeniably squishy. It’s definitely not the fattest or most even single but it is a step in the right direction. Only the first of many, I hope. In a perfect world, we would spin singles with equal yardage and have none left over after plying. I’ve heard tales of this happening to a few lucky individuals but, for the rest of us, there’s going to be extra. Those last few, or not so few, yards sit on bobbins or spindles or straws or chopsticks while we forget about them completely for the next project. That is until we need that spindle or ran out of straws for extra yarn. I know that I have plenty of un-plied singles from when I first started spinning and had no idea what to do with the extra. My last few spinning projects have also left me with leftovers and I’m tired of them taking up space in my spinning box. The remaining yardage can easily be turned into a 2-ply yarn since the hard work of drafting is already done. The leftover single can have a lot more yardage than you think. A plied mini-skein can give you a little breathing room on the final rows of a project or be enough to knit a small trinket - like a Christmas ornament or bookmark. Plus, the mini skeins are cute and perfect for petting on a stressful day. 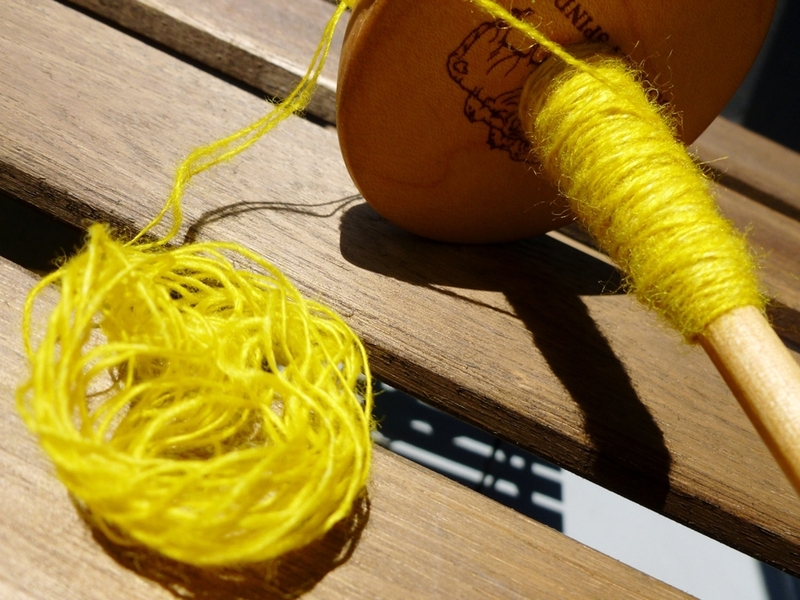 Wind the yarn off the spindle (or bobbin or straw) into a center pull ball. You can use a ball-winder, a nostepinne, or your hand. Just go slowly or risk snapping more delicate singles. Once wound, pull out the end from the center and the outside. Tie them together in a knot and you’re ready to start plying with a spindle or a wheel. The ends will pull out smoothly in the beginning but, as more of the singles move to the spindle, the ball will start to collapse. Go slowly and keep an eye out for potential tangles. Let the fresh yarn rest for 24 hours before picking something small to skein up the yarn before dunking it in a bath. I used two small lamps and a book for a third un-pictured, mini skein. Finally plied and finished, the yellow skein has 13 yds and the blue has 29 yds. I haven’t quite figured out what I’ll do with these skeins but, in the meantime, they’ll look cute on my desk.